The ZX Spectrum was my computer throughout my childhood, and I loved it to bits. It was my first development platform, during my futile attempts to reproduce games I saw in arcades. The Spectrum has its own BASIC interpreter, and it was a solid way to introduce users to computer programming. The interpreted language will never offer the same performance as assembly, but it was easy to learn. I wrote all sorts of little games, which are now unfortunately lost.  Here is a simple BASIC program which allows the user to move an animated person on the screen. 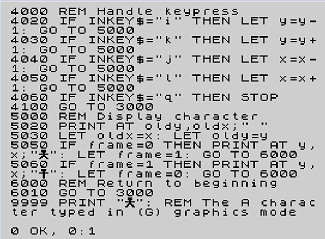 It's easy to understand, and can help if you wish to learn how to program the ZX Spectrum. Moreover, here is an image of the Spectrum keyboard for reference. This type of multi-function keys was unique to the Sinclair computers, and while it allowed experts to type less, the learning curve was steep, scaring beginners off. I was pleasantly surprised that I still remembered many of the multi-functions after about seventeen years. - rom in SNA format - the compiled rom in SNA format. Load it in a ZX Spectrum emulator which supports this format. - rom in Z80 format - the compiled rom in Z80 format. Load it in a ZX Spectrum emulator which supports this format. - Speccy emulator - Supports both SNA and Z80 formats.